Roof Replacement Costs in Portland | How Much Does a New Roof Cost? We’ll get to the disappointing part right up front – we are not able to calculate exactly how much a new roof will cost for your specific home here on our website. For that, one of our professional estimators needs to visit your property in person to note and analyze numerous variables. Accepting that fact, we can still give you some useful information on Portland roof replacement costs that will help you become familiar with the concepts and general principals that affect the new roof installation pricing for your home. To see a more comprehensive list of specific items that go into the cost of a roofing project, check out this article on component in a roof’s cost. Simple Asphalt Roll Roofing – Generally not used on residences, but rather more utilitarian structures such as sheds, detached garages, patio covers, etc. 3 Tab Shingles – Note that most of the material cost savings from this shingle type are erased by the extra labor required due to more labor intensive nailing plans, thus it is primarily chosen when it’s specific look is desired. Architectural Laminate Composition Shingles – The most common composition roof type used today. Heavy Grade Laminate Shingles (Presidential style shingles, tri-laminate shingles) – Varying degrees of higher quality shingle provide both a more distinct look and a longer lasting, more durable roof. Cedar Shakes – A renewable resource, cedar roofs offer one of the most unique and beautiful roofing options. Many homes are designed to specifically have a cedar roof. Heavy Cedar Shakes – A thicker grade of cedar shake that allows the benefits of cedar with an increase life expectancy, often to 50 years. Concrete Tiles – A durable, albeit fragile, long-lasting option that is now available in numerous styles and colors. Fancy Composition Shingles – For very specific design needs, “fancy” shingle are made of a very durable composition and allow for unique aesthetic appeal. Metal Panels and Tiles – You either are fine with the look of metal or you are not. Metal roofs vary from standing seam to aluminum tiles. All are long lasting. There are numerous factors that determine the overall difficulty of a roofing job, and hence have an effect on the price of the roof. Pitch – The steeper the pitch, the more expensive the cost. Tear off or recover – Tearing off the old roof is more effort and expense than a recover, but recovers often are not covered by manufacturer’s warranties. Existing layers of roofing – The more layers to be torn off, the higher the cost. Potential trouble spots, requiring multiple layers of underlayment – Some roofs were designed to have problems from the start with issues such as valleys that drain directly in to sidewalls, for example. Extra waterproofing underlayment is more expensive but wise in such situations. Ease of disposal – Some sections of roof can be disposed of directly into the drop box, truck or trailer while others require off loading to the ground and then being transported around the house. Surrounding landscape and environment – Are there trees limbs literally resting a top the roof or ponds or pools exceptionally close to the house that require extra protection? If so, these will make roofing costs increase. Additional needed repairs, enhancements – Examples include unexpected rot in the sheathing, rafters for fascia boards or possibly the need to construct the new roof with a cricket behind the fireplace if it had previously been a trouble spot. Assorted issues – Satellite dishes or basketball backboards that need removal and reattachment, patio covers that rest on the main house roof all add to cost. Warranties affect cost as well. First, you need to realize that there is a distinction between the labor and materials warranty. The material warranty comes from the manufacturer while the labor warranty is from your roofing company. Most manufacturer warranties are prorated, meaning the older the roof, the less available credit you have against any problems that arise. 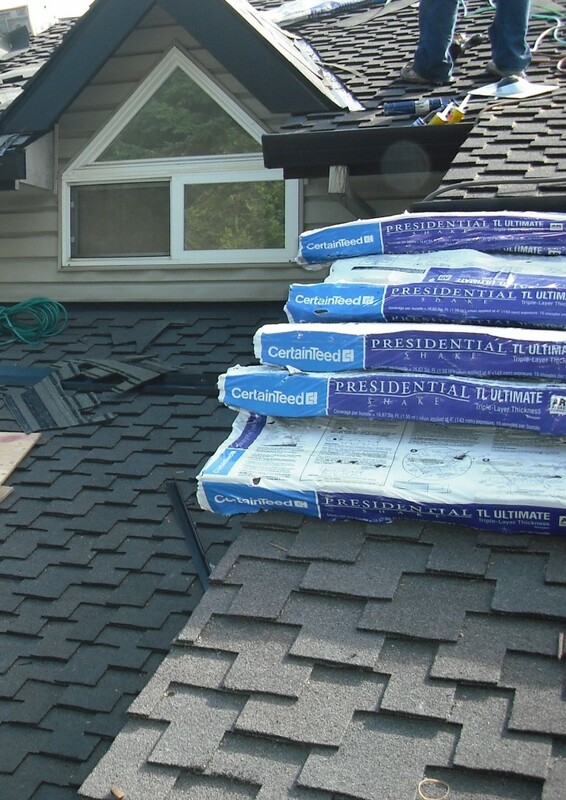 Special warranty programs, such as the Certainteed Sure Start Integrity Plus Roof, through the use of additional protective materials, builds in an additional period where the proration does not apply and full reimbursement is available as well as having a more favorable proration when it does finally kick in. Keep in mind that few roofing material manufacturers will warranty their product when used in a roof recover process. Regarding labor warranties, not only do these vary from non-existent to many years, but ultimately they are only as good as the company providing the warranty. The majority of roofing contractors are out of business within their first five years. Then there are others that while still in business, have no intention to honor warranties and make it exceptionally difficult to get them to stand behind their work. Ultimately, we recommend using a company with a verifiably good reputation that has been in business at least five to ten years. To tie all of this together, some good old perspective is needed to understand why the cost of your roof might be significantly different than that of your neighbor. A great example to illustrate this would be if you are comparing the same size house, but House A has a mild pitch, needs only one layer of previous roofing material torn off, is able to have materials easily thrown into the disposal, and it getting a standard 30 year architectural composition roof (now called lifetime by the manufacturers), to House B which has a steep pitch, 3 layers of old roofing, a fair distance to haul the debris, and is having a heavy weight presidential shingle installed. House B could easily cost twice as much as house A. As you can see, there is much more to the cost of a roof than just the size. We are ready to help you sort through all of the variables and provide you with a firm, written, easy to understand proposal. Call us today at (503) 570-7663. P.S. Don’t forget – Payment plans can help virtually everyone afford a new roof, regardless of it’s size, type and cost. If you need a new roof right now but don’t have enough saved up yet, talk to us about our great payment options.